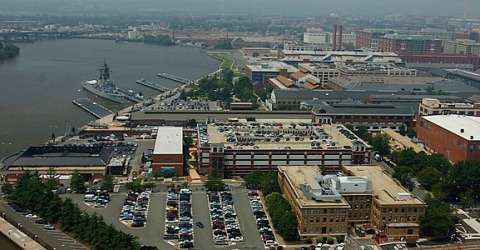 OUTSIDE THE WASHINGTON NAVY YARD, D.C. – Law enforcement have concluded that a shooting scare here at the heart of the nation's capital Thursday morning was a false alarm after sweeps of the area, which focused on the sprawling headquarters building that was the scene of a 2013 mass shooting. Sweeps of the Naval Sea Systems Command headquarters and surrounding buildings found no evidence of shots fired, after a police call that triggered a massive response from area law enforcement and a lockdown that kept employees shut into their work stations or off base. Law enforcement sounded the all clear around 10 a.m., and some police began leaving the scene afterwards. At 10:20 a.m., the Navy confirmed that no employees had been injured and there was no evidence of shots fired on the base, saying the Naval Criminal Investigative Service was conducting an investigation. The response began at 7:29 a.m., when an employee called from a building on the Navy Yard to report possible gun shots, according to a Navy statement Thursday morning. Police have ruled out a hoax, saying that the 9-11 call was an appropriate alert sent by a concerned employee. "The person the who made the call heard what she thought may have been gunshots and she made the call, which is what employees here are trained to do," said Metropolitan Police Chief Cathy Lanier. "We have no concerns that this was a hoax whatsoever." Note: I've been following this story closely, as I spent most of my working life on Navy bases. For more than 37 years of U.S. Navy/Defense Department service I did security work and for my last ten years of service the DoD command where I served as administrative officer was stationed on a Navy base in Philadelphia. I wrote our command's shelter in place, emergency evacuation, continuity of operations, and other security plans. I was pleased to see such a fine and speedy response to this alert.